CHINESE officials describe the far western province of Xinjiang as a “core area” in the vast swathe of territory covered by the country’s grandiose “Belt and Road Initiative” to boost economic ties with Central Asia and regions beyond. They hope that wealth generated by the scheme will help to make Xinjiang more stable—for years it has been plagued by separatist violence which China says is being fed by global jihadism. But the authorities are not waiting. In recent months they have intensified their efforts to stifle the Islamic identity of Xinjiang’s ethnic Uighurs, fearful that any public display of their religious belief could morph into militancy.Xinjiang’s 10m Uighurs (nearly half of its population) have long been used to heavy-handed curbs: a ban on unauthorised pilgrimages to Mecca, orders to students not to fast during Ramadan, tough restrictions on Islamic garb (women with face-covering veils are sometimes not allowed on buses), no entry to many mosques for people under 18, and so on. But since he took over last August as Xinjiang’s Communist Party chief, Chen Quanguo has launched even harsher measures—pleased, apparently, by his crushing of dissent in Tibet where he previously served as leader. As in Tibet, many Xinjiang residents have been told to hand their passports to police and seek permission to travel abroad. In one part of Xinjiang all vehicles have been ordered to install satellite tracking-devices. There have been several shows of what officials call “thunderous power”, involving thousands of paramilitary troops parading through streets. 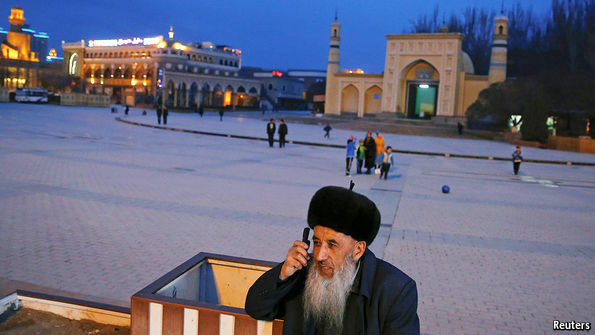 Last month, new rules came into effect that banned “abnormal” beards (such as the one worn by the man pictured in front of the main mosque in Kashgar in south-western Xinjiang). They also called on transport workers to report women wearing face veils or full-body coverings to the police, and prohibited “naming of children to exaggerate religious fervour”. A leaked list of banned names includes Muhammad, Mecca and Saddam. Parents may not be able to obtain vital household-registration papers for children with unapproved names, meaning they could be denied free schooling and health care. Residents have also been asked to spy on each other. In Urumqi, the region’s capital, locals can report security threats via a new mobile app. People living in Altay in northern Xinjiang have been promised rewards of up to 5m yuan ($720,000) for tip-offs that help capture militants—over 200 times the local income per person. Across Xinjiang residents have been asked to inform the authorities of any religious activities, including weddings and circumcisions. The government is also testing its own people’s loyalty. In March an official in Hotan in southern Xinjiang was demoted for “timidity” in “fighting against religious extremism” because he chose not to smoke in front of a group of mullahs. Mr Chen is widely rumoured to be a contender for a seat in the ruling Politburo in a reshuffle due late this year. Displays of toughness may help to ingratiate him with China’s president, Xi Jinping, who has called for “a great wall of iron” to safeguard Xinjiang. Spending on security in Xinjiang was nearly 20% higher in 2016 than the year before. Adverts for security-related jobs there increased more than threefold last year, reckon James Leibold of La Trobe University and Adrian Zenz of the European School of Culture and Theology at Korntal, Germany. Interesting to note how The Economist bashes China. When these Uyghurs fights westerners bombing Afghanistan, Syria, Iraq, Libya etc they are “terrorists”. When these same Islamists, who throw people off buildings for being gay, crucify Christians, and set fire to prisoners of war, do the same thing in China they suddenly become “Freedom Fighters”.